The Bizone issued the four stamps shown above (Mi. #69-72, Sc. #B298-01) on August 15, 1948. They commemorate the 700th Anniversary of the Laying of the Cornerstone of the Cologne Cathedral in 1248. 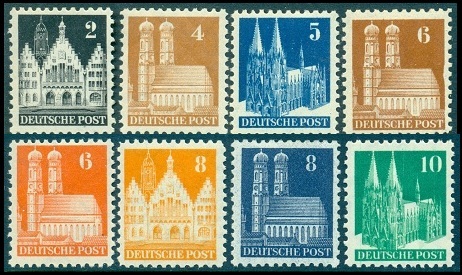 The stamps depict the Madonna, the Three Kings, and two different views of the Cologne Cathedral. The surtax went to fund the reconstruction of the cathedral. The twenty-eight definitive stamps shown above (Mi. #73-100, Sc. #634-61) were issued beginning on September 1, 1948 and continuing through 1951. The stamps were lithographed on white paper which was watermarked multiple "D P", and they were perforated 11 x 11 or 11 1/2 x 11. 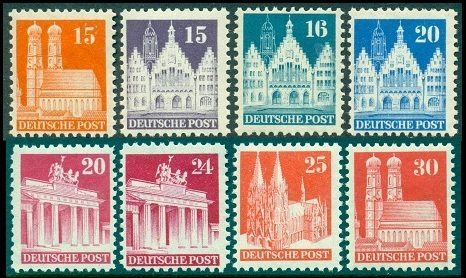 The theme of these new definitive stamps was German architecture. 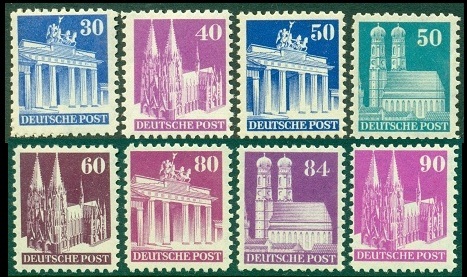 The new Pfennig denomination designs featured the Frankfurt Town Hall, the Church of Our Lady in Munich, the Cologne Cathedral, and the Brandenburg Gate in Berlin. 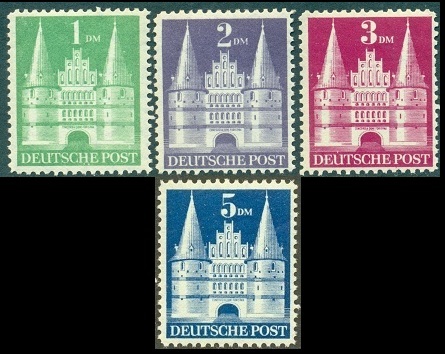 The new Deutsche Mark designs featured the Holsten Gate in Lubeck. The Deutsche Mark denominations come in two major types. Type I has four steps in the entryway of the gate (short stairway). Type II has seven steps in the entryway of the gate (long stairway). The Type II stamps are the scarcer of the two. The stamps shown in the image above are all Type I.
Fifteen different stamps from this new series were also issued with perforation gauge 14. In most cases, perforated 14 stamps (Mi. #73eg // #97eg, Sc. #634a-658a) are much scarcer than the perforated 11 1/2 x 11 or the perforated 11 x 11 stamps (Mi. #732wg // #100wg, Sc. #634-61). Many of the stamps in this series also exist imperforate. For the specialist, this series offers a multitude of collecting opportunities. Of special note is the watermark used on this series, which exists in four different varieties, with the "D" in the watermark pointing to the right, downward, left, and upward. The final two Bizone stamps issued during 1948 are shown above (Mi. #101-02, Sc. #B302-03. 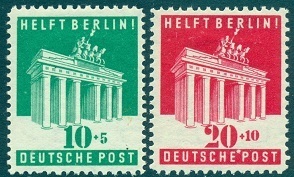 These two stamps, issued December 14, 1948, feature the Brandenburg Gate in Berlin and they are inscribed "HELFT BERLIN" or "HELP BERLIN". The surtax amount provided aid to the city of Berlin.